First I logged to my BW 7.5 and selected my query. You have to make sure that the option Use Data Source Formula-Optimized is active. If not, you cannot use it. If it is not active you can in return create a Crosstab which you cannot do if it is formula optimized. So now just create an example. First I create a simple SAPSelectMember to use it for the next steps. Now I build a little compley formula to get my data. As you might wonder, you see now #RFR. This mean you need to refresh your data source and now you see the result. After you change the Filter Component you always see the #RFR. This could be better, I hope SAP will make improvements here. Now you can use this "new" function to build beautiful dashboards. But what is now the thing, why I should use the new function? 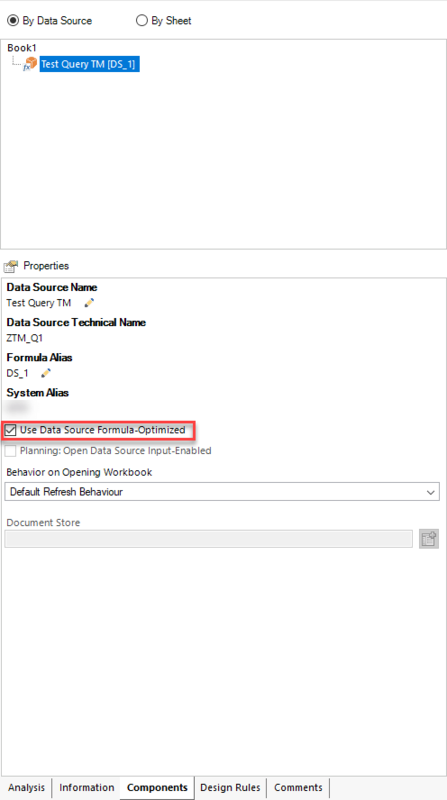 You sure now the SAPGetData formula from earlier versions. But the SAPGetData formula in older versions need a query view that contains all cells which you want to query. That means you have to drill down hierarchies and add dimensions if you want to query these characteristic combinations. This can mean, that you have to quest 100.000 cells to represent two values. In the new handling since the actual version it is the other way around. This mean you write the combination you need and Analysis Office generates the best possible queries. Thanks to Alexander Peter for clearing this up.